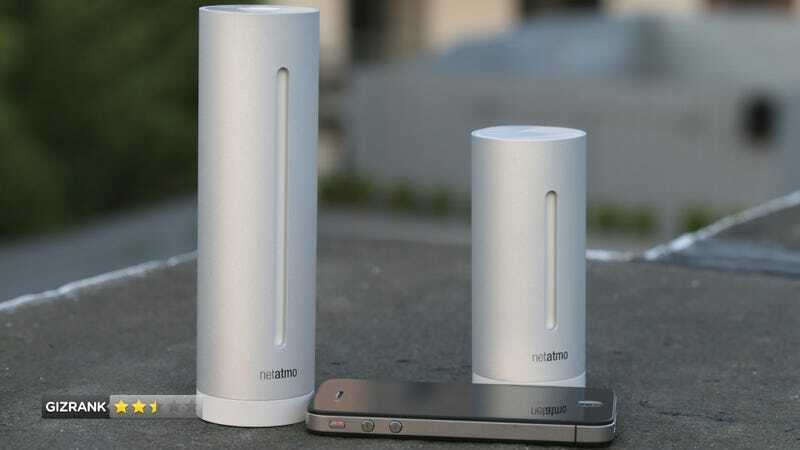 Netatmo Urban Weather Station Review: What the Hell Is the Point of This Thing? A personal weather station that beams environmental data up to the cloud then down to a colorful smartphone app sounds like an awesome uber gadget. Exciting! But in the end the Netatmo Urban Weather Station just left us confused. A $180 "weather station" that records seemingly random metrics about indoor and outdoor environmental conditions. People who don't trust the National Weather Service, mercury thermometers, or their own common sense. We think? This is nothing like other weather stations that conveniently present information on easy-to-read displays. Instead, you get two drab cylinders stuffed with sensors and a mobile application. A large indoor AC-powered cylinder measures indoor noise level, CO2, humidity, and temperature. A small outdoor unit, powered by four AAA batteries, measures temperature and humidity. You read the data with an app. Once it's configured with your local Wi-Fi, you use this weather station like you use any free weather app for Android or iOS. It shows you weather data on your phone or tablet. Switch between indoor and outdoor info, or graph the data over time. It tells you about the weather! It tells you about the weather on your smartphone or tablet, which as it turns out, could tell you the same simple weather facts before you bought a $180 weather station. Where's the added value to owning this ugly, inconvenient thing? It measures indoor noise levels. What does a decibel meter have to do with weather? And isn't noise self-evident? It is useful to learn your indoor CO2 levels. Beyond that, the system doesn't collect any data that isn't easily accessible or obvious. The outdoor data sensors should really measure more than two measly data points for temperature and humidity. After we went to the trouble of setting up the outdoor probe to record two simple metrics that are already available elsewhere, it didn't even work properly. We set it up out of direct sunlight, but on hot days it still registered temperatures much hotter than the actual outside temperature. During the hottest parts of the day, this probe went completely offline. What's worse: No information or inaccurate information? The outdoor station is supposed to work fine at a distance of up to a 300 feet from the indoor station, but we found that to avoid missing measurements, it's better to keep the distance to about, say, 20-30 feet. It can come up with a forecast. But it doesn't do it on its own: The data is provided by a company called MetroGroup. No. If you're the type of person who's going to collect data and invest in a weather station, you probably want a ton more information than this provides. Not just basic meteorological data you can get for free elsewhere online.